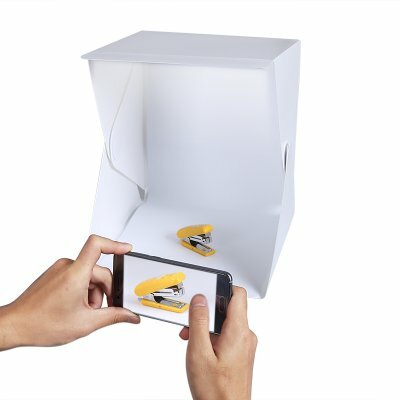 Successfully Added Portable Photo Studio - For Smartphone Photography, 20x LED, 750 Lumen, No Shadows, Foldable Design, Easy To Install to your Shopping Cart. Shoot studio-quality pictures with your smartphone thanks to this amazing foldable photo studio. With its compact and lightweight design, this accessory can be easily carried around. It is furthermore foldable, making it easy to store away when not in use. This foldable photo study for smartphone photography is easy to assemble without the need for any tools. Simply set it up, and you’ll be all set to start shooing breathtaking product pictures with your phone. This all-in-one photo study features everything you need for snapping crisp images. It is great for small business owners who wish to shoot product images in a fast, affordable, and professional manner. This portable photo studio features an ultra-bright light source. It furthermore comes with a silver reflective interior that minimizes the amount of shadows. Thanks to this, you’ll be treated to a pure white background. Therefore, you’ll never have to worry about cropping your images again. Besides its white background, this foldable photo studio also comes with a black background. With this useful photo accessory at your side, you’ll be able to snap stunning pictures anywhere you are. Whether you’re a freelance photographer or entrepreneur, this gizmo is sure to meet all your demands. This portable photo studio comes with a 12 months warranty, brought to you by the leader in electronic devices as well as wholesale electronic gadgets..